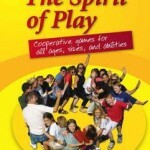 In addition to the element of softwar, which has become a minor part of New Games, the concept of “creative play” came from a friend of Stewart’s named George Leonard, author of the book The Ultimate Athlete. What was involved here was placing a player “in an open environment and encouraged to use his/her imagination to devise new play forms.” The vitally significant part of this was “How we play the game may turn out to be more important than we imagine, for it signifies our way of being in the world.” Thus, players not only were able to change the games they were playing, even during the course of play, they were able to invent entirely new games. 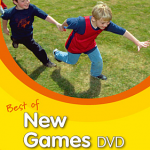 The other significant addition to the New Games idea came from the human potential movement – Trust Games. In these activities, players had to give up control and literally trust other players to take care of them. And that is much more scary than it sounds. In the game of Trust Lift, for example, the group lifts a person above their heads and moves them around while in the air before lowering them. If you are the person being lifted, this is a frightening, exhilarating, and peaceful experience, all at once. In part 5, we look at some places New Games has gone since its beginnings…. My brother suggested I would possibly like this website. He used to be totally right. This post actually made my day. You can not imagine simply how a lot time I had spent for this info! Thank you! Hiya. Basically wanted to write a brief comment and inform you you that I most certainly agree with your particular blog post. Completely spot on. Dead indited subject material, thank you for selective information. “No human thing is of serious importance.” by Plato. Some truly terrific work on behalf of the owner of this internet site , absolutely outstanding subject matter. Thanks for sharing superb informations. Your web site is very cool. I’m impressed by the details that you’ve on this site. It reveals how nicely you perceive this subject. Bookmarked this website page, will come back for more articles. You, my pal, ROCK! I found just the info I already searched everywhere and simply could not come across. What a perfect web-site. Have you ever thought about adding a little bit more than just your articles? I mean, what you say is important and all. Nevertheless think of if you added some great pictures or videos to give your posts more, “pop”! Your content is excellent but with pics and videos, this site could definitely be one of the very best in its field. Wonderful blog! The very crux of your writing while sounding reasonable in the beginning, did not work perfectly with me personally after some time. Somewhere within the sentences you managed to make me a believer but only for a very short while. I nevertheless have a problem with your leaps in assumptions and one would do well to help fill in those breaks. In the event you can accomplish that, I will definitely end up being fascinated. Thanks for the strategies you are sharing on this blog. Another thing I would really like to say is getting hold of some copies of your credit file in order to inspect accuracy of any detail is the first activity you have to conduct in credit repair. You are looking to thoroughly clean your credit profile from destructive details errors that mess up your credit score. Hi! I’ve been reading your web site for a while now and finally got the courage to go ahead and give you a shout out from New Caney Tx! Just wanted to tell you keep up the good work! Would you mind if I published this piece of content on my webpage? I would give you credit and a link back to your blog. Many thanks, and if possible let me know here! We’re a gaggle of volunteers and starting a brand new scheme in our community. Your site provided us with useful information to paintings on. You’ve performed an impressive job and our entire neighborhood will likely be grateful to you. Thanks, I have recently been seeking for information about this subject matter for ages and yours is the best I’ve located so far. I’m extremely inspired along with your writing abilities as smartly as with the structure in your weblog. Is this a paid theme or did you modify it yourself? Anyway stay up the nice high quality writing, it is uncommon to look a great weblog like this one nowadays..
Youre so cool! I dont suppose Ive learn something like this before. So nice to search out someone with some authentic ideas on this subject. realy thank you for beginning this up. this website is something that is needed on the net, somebody with a little bit originality. useful job for bringing one thing new to the internet! I’ve observed that in the world the present day, video games would be the latest popularity with children of all ages. Often times it may be not possible to drag your son or daughter away from the video games. If you want the best of both worlds, there are numerous educational games for kids. Thanks for your post. I would like to get across my love for your generosity supporting men and women who should have guidance on in this idea. Your special dedication to passing the message along was especially invaluable and have in most cases permitted men and women just like me to achieve their objectives. The interesting useful information denotes so much a person like me and a whole lot more to my mates. Best wishes; from each one of us. I am glad to be a visitant of this unadulterated weblog, regards for this rare information! I have noticed that smart real estate agents all around you are getting set to FSBO Promoting. They are knowing that it’s more than simply placing a poster in the front yard. It’s really concerning building connections with these traders who sooner or later will become customers. So, once you give your time and energy to serving these vendors go it alone — the “Law involving Reciprocity” kicks in. Great blog post. This will be a great web page, might you be involved in doing an interview about how you created it? If so e-mail me! It is really great piece of information, thanks for posting this kind of amazing post. I am also very found of video games. Your information is perfect and true. are speaking intelligently about. Now i’m very happy that I found this in my hunt for something regarding this. In this case, like the mystical masters of Baba’s tradition (i.e. Very interesting article we are just working on employing something similar within our current mobile game project for our dentist client. The workshop was really fun and helped me build confidence in sharing some New Games in the future.